The course consists of 3 classroom-based sessions plus workplace observation, tutorial and email support. Please click here to download the information leaflet. 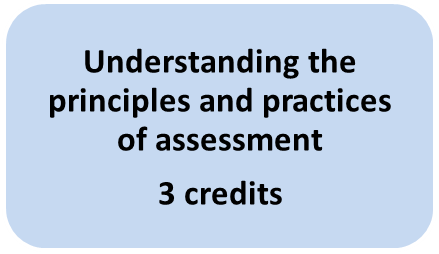 NOCN Level 3 Award in Understanding the Principles of Practices of Assessment is for those who wish to gain an understanding of the principles and practice of assessment without any need to practice as assessors. NOCN Level 3 Award in Assessing Competence in the Work Environment is for assessors who deliver qualifications that use the term ‘NVQ’ in their title, and for other non-NVQ staff whose purpose is D1 Confirm occupational competence. NOCN Level 3 Award in Assessing Vocationally Related Achievement will ensure that staff assessing non-NVQ or non-competence-based vocational qualifications within the RQF on a ‘devolved’ basis meet agreed standards of assessment.